i came across this extraordinary frank lloyd wright library table in one of my books and i was in awe of it. the metropolitan museum of art, in new york city, was credited for having it in their collection so i went there and found it... and more. the table is from wright's francis w. little's house (top image) and a shot of the house's fully recon- structed, in the museum, little house living room was there as well. 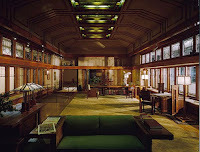 the site says, "The Frank Lloyd Wright Room was originally the living room of the summer residence of Frances W. Little, designed and built between 1912 and 1914 in Wayzata, Minnesota, a suburb of Minneapolis. The room epitomizes Wright's concept of "organic architecture," in which the building, setting, interior, and furnishings are inextricably related. The house is composed of a group of low pavilions interspersed with gardens and terraces, which, in plan, radiate from a central symbolic hearth. as the style looked so clearly japan-influenced, i suddenly remembered that one of the earliest americans to go to japan, edward morse (here and here), had actually written and illustrated a book called "japanese homes and their surroundings." that book is completely online as well. this book is stunningly charming and interesting: "Within twenty years there has gradually appeared in our country a variety of Japanese objects conspicuous for their novelty and beauty, — lacquers, pottery and porcelain, forms in wood and metal, curious shaped boxes, quaint ivory carvings, fabrics in cloth and paper, and a number of other objects as perplexing in their purpose as the inscriptions which they often bore. Most of these presented technicalities in their work as enigmatical as were their designs, strange caprices in their ornamentation which, though violating our hitherto recognized proprieties of decoration, surprised and yet delighted us. The utility of many of the objects we were at loss to understand; yet somehow they gradually found lodgment in our rooms, even displacing certain other objects which we had been wont to regard as decorative, and our rooms looked all the prettier for their substitution. The first sight of a Japanese house, — that is, a house of the people, — is certainly disap- pointing. From the infinite variety and charming character of their various works of art, as we had seen them at home, we were anticipating new delights and surprises m the character of the house; nor were we on more intimate acquaintance to be disappointed. As an American familiar with houses of certain types, with conditions among them signifying poverty and shiftlessness, and other conditions signifying refinement and wealth, I was not competent to judge the relative merits of a Japanese house. The first sight, then, of a Japanese house is disappointing; it is unsubstantial in appearance, and there is a meagreness of color. Being unpainted, it suggests poverty; and this absence of paint, With the gray and often rain-stained color of the boards, leads one to compare it with similar unpainted buildings at home, — and these are usually barns and sheds in the country, and the houses of the poorer people in the city. With one's eye accustomed to the bright contrasts of American houses with their white, or light, painted surfaces; rectangular windows, black from the shadows within, with glints of light reflected from the glass; front door with its pretentious steps and portico ; warm red chimneys surmounting all, and a general trimness of appearance outside, which is by no means always correlated with like conditions within, — one is too apt at the outset to form a low estimate of a Japanese house. An American finds it difficult indeed to consider such a structure as a dwelling, when so many features are absent that go to make up a dwelling at home, — no doors or windows such as he had been familiar with; no attic or cellar; no chimneys, and within no fire-place, and of course no customary mantle; no permanently enclosed rooms; and as for furniture, no beds or tables, chairs or similar articles, — at least, so it appears at first sight. One of the chief points of difference in a Japanese house as compared with ours lies in the treatment of partitions and outside walls. In our houses these are solid and permanent; and when the frame is built, the partitions form part of the frame-work. 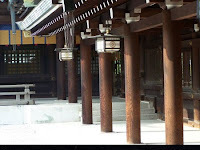 In the Japanese house, on the contrary, there are two or more sides that have no permanent walls. Within, also, there are but few partitions which have similar stability; in their stead are slight sliding screens which run in appropriate grooves in the floor and overhead. These grooves mark the limit of each room. we have looked at this before (here and here and here and here, etc. ), but it bears repeating. every single one of the points in the met's description of wright's contributions was written about nearly 30 years earlier in morse's descriptions of japanese homes. and we know too that mackintosh, maybeck, and greene & greene were influenced thusly as well. it's all a beautiful thing to see, don't you think? why thank you, pignouf. you are too kind! and i am delighted to see you. Always wonderful things in your blog ! Very interesting article. 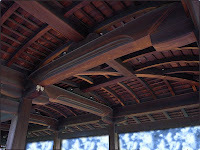 A journey from a Wright library table to Japanese interior and exterior design. 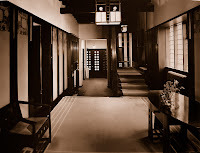 The analogy between Wright and traditional Japanese architectural and interior design is probably spot on, I say probably because there has to be some room for potential disagreement, though I don't think there can be in this case as you seem to have everything fairly sewn up.